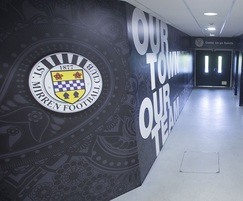 St Mirren FC is kicking off the new season with a new supporter chosen tunnel area design. The stadium hadn’t been changed since it was built in 2009. 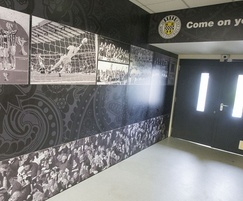 The £7,000 revamp was completed in the light of St Mirren’s promotion into the Scottish Premier League. Chairman, Gordon Scott, approached Rearo in order to help with the project. 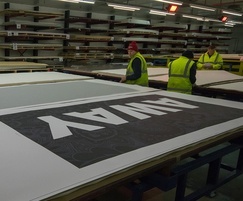 The plan was a collaborative effort involving laminate suppliers Formica Group, Gate Creative and Rearo. To construct the ideas and bring the tunnel to life, Rearo decided on using Younique® by Formica Group. The use of the Younique service for digitally rendered panels meant that any design could be translated onto the tunnel walls. Rearo contacted Gate Creative’s director and graphic designer Ken Doig to design the tunnels inside wall panels. After a meeting with the St Mirren Chairman and the directors about the fan suggestions, the design of the new tunnel area was decided. 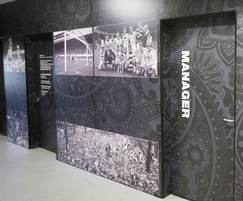 The new design documents the story of the Saints from their origins in 1877, featuring historic victories and inspirational players past and present, top goal scorers and their club crest, over a matte grey/black paisley pattern, creating a great visual impact aimed to inspire the players as they go out on to the field.